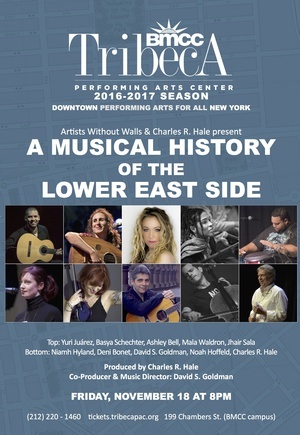 BMCC Tribeca Performing Arts Center, the longest operating performance venue in lower Manhattan, proudly announces A Musical History of the Lower East Side, performing on Friday, November 18 at 8PM. This special concert will consist of songs reflecting the ethnicity of the Irish, Italian, Jewish, Hispanic and African- American residents of New York’s Lower East Side, including Jazz, Opera, Irish, Latin, Italian and Yiddish music, along with historical narration and video by Charles R. Hale. This show premiered at Rockwood Music Hall in 2015 to a standing room only crowd. Tickets are $25. Students and Seniors: $15. To purchase tickets, call Ticketing Services at (212) 220-1460. Tickets can also be purchased by clicking on the link at the top of this listing or by visiting the Box Office at 199 Chambers Street, Tues-Sat from 12PM – 6PM. Note: Buyers of 5 tickets or more: $15– must call to purchase these.